May 2013 - Radii | Go Digital. Go Radii. The World According to Us has Launched! Webcast Now Available! The World According to Us has launched! 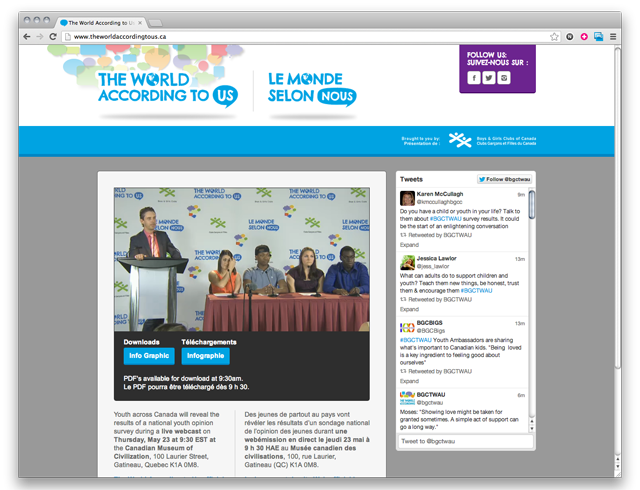 Yesterday, May 23rd, the BGCC held a fantastic webcast at the Canadian Museum of Civilization in Ottawa to announce opening of The World According to Us. 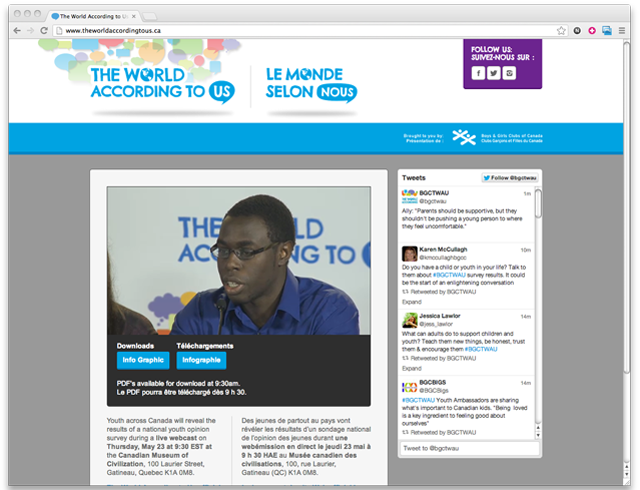 The webcast was a great success and was met with ample enthusiasm and media coverage. With such a great reception, the day was topped only by the site launch! Be sure to check out the webcast for all the details! And stay tuned to learn more about The World According to Us initative! 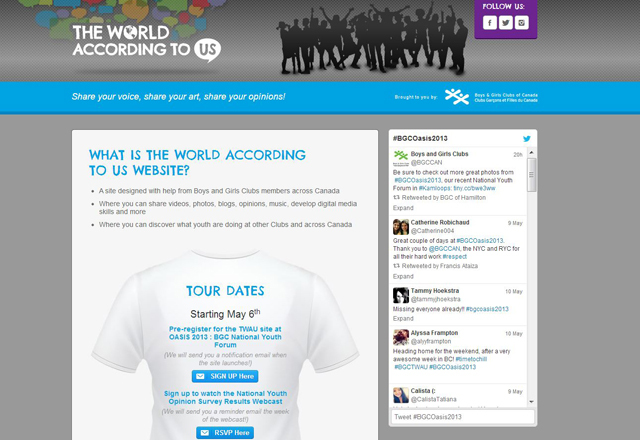 ‘The World According to Us’ Launches on May 23rd! Are you ready? We're excited to announce that in a mere nine days, The World According to Us--a fantastic intiative by the Boys and Girls Clubs of Canada--will launch! 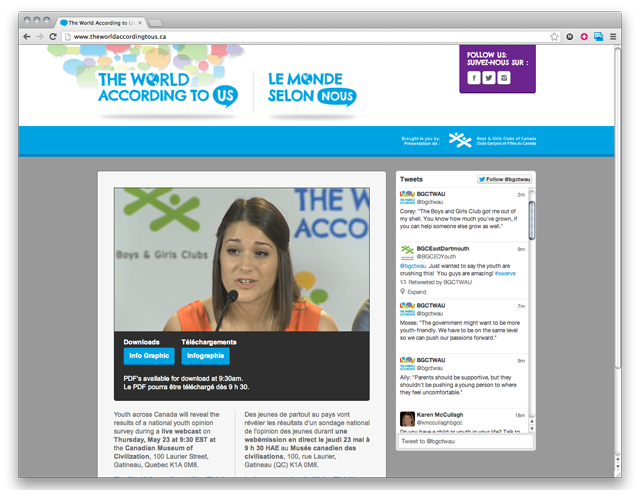 The World According to Us is a new online social platform designed specifically to let the voices of BGC members across Canada be heard. While it launches on May 23rd, splash pages are already up and pre-registration is in full swing! As a small component to a much larger initiative, The World According to Us has already started to catch on with over 200 pre-registrants. There's no reason to wait to sign up: check it out now! Following a BGCC webcast on the 23rd in which the team will tell all about the program and platform, the site will be available soon thereafter. We can't wait to share all the good stuff coming in the next few weeks, including the upcoming webcast and all the exciting news as it comes in!